Friends and supporters from all over Louisiana gathered for a one-day seminar not only to study the secular attack on the Faith but to plan future action. With this in mind, nearly 70 supporters, members and friends crowded into the lecture room at the Hampton Inn in Lafayette, La. on Saturday, March 18. The conference speakers focused on defending the Catholic faith in a hostile cultural climate and convoked those present to oppose and protest the coming movie based on The Da Vinci Code book. 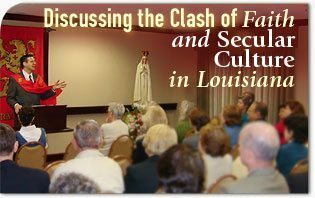 The 2006 TFP Regional Conference was organized by the Louisiana TFP office in Lafayette as a way to focus on the ongoing Cultural War that affects daily life. Four speakers from the American TFP headquarters in Pennsylvania came down especially for the event. Some friends from Texas also attended. The TFP speakers based their speeches on the principles of the book, Revolution and Counter-Revolution by Prof. Plinio Corrêa de Oliveira. The first talk was by TFP director John Horvat who spoke on “The Coming Great Clash.” He described the modern pursuit of happiness that excludes the idea of tragedy and does everything to create the illusion of perfect happiness. He contrasted what he called “a society in denial of tragedy” with the Catholic viewpoint that teaches that all men must suffer tragedy and the best way to deal with it is to confront frontally life’s sufferings. “We can confront our culture of denial by confronting life’s tragedies with courage, savoring life’s joys when they appear and confiding in Providence in everything,” Mr. Horvat concluded. Speaking about how to choose one’s battles in the Cultural War was the topic presented by American TFP member Michael Drake. His talk, “Why Some Issues and Not Others: Hitting Them Where it Hurts,” developed the point of choosing battles in the Cultural War. He specifically mentioned moral issues that touch sensitive chords in the American soul and why this happens. TFP member Michael Whitcraft delivered a masterful presentation on “The Suffering of Life, True Joy and Convivium.” Mr. Whitcraft developed further the theme of the first talk by exploring the common understanding of what he called the “Hollywood myth of perfect happiness,” showing how it shallowly promises only material happiness. In the end, this secular vision of life really only delivers lies, frustration and tears as opposed to the Catholic concept of happiness in giving, sacrificing and overcoming challenges. The seminar moved to action by holding a special session on The Da Vinci Code and the TFP campaign to oppose the movie. America Needs Fatima director Robert E. Ritchie outlined the campaign plans in response to the May 19 release of the film. Mr. Ritchie summarized a list of action items which will include protests outside over 1,000 theaters nationwide. He invited all participants to become actively involved in their areas. Of course, as in any TFP event, the seminar was more than just lectures. It was an occasion for being together with others of like mind. No event in Louisiana is complete without a tasty meal together. A buffet lunch with fine Cajun cooking was held at the nearby Lafayette’s Restaurant. In a specially decorated banquet room, TFP members and friends enjoyed lively conversations inspired by the same desire to defend the Faith. This first regional conference in Louisiana with its emphasis on action against The Da Vinci Code movie was a perfect opportunity to unite friends and prepare them for action in the cultural battles ahead. This entry was posted in Da Vinci Code, Events of 2006 and tagged 2006, Action, ANF, blasphemy, book, campaign, Catholic, conference, Counter-revolution, cultural war, Da Vinci Code, director, happiness, John Horvat, life, Louisiana, modern, movie, protest, regional, revolution, Robert Ritchie, speaker, TFP, theater by TFP.org. Bookmark the permalink.